YETI Tundra 35 Review – What’s Good and Bad about this Cooler? Home » Reviews » YETI » YETI Tundra 35 Review – What’s Good and Bad about this Cooler? The Tundra 35 is one of the smallest portable coolers in YETI’s Tundra series. Along with extremely durable construction, this cooler features great insulation, easy carrying, 5-year warranty and many more. It is made for people who love camping and don’t want to keep investing money on a cooler every time. This can be a great backseat companion in your car, SUV, truck, or 4-wheeler. Though it comes at a premium price tag, the quality and features make this cooler worthwhile. YETI is a well-known brand of coolers and outdoor gears. They have made some premium quality and high performing coolers ranging from 35 quart to 350 quart size under their tundra series. The Tundra 35 is the smallest cooler in their Tundra series. The Tundra coolers are made for avid camper who needs a cooler in their everyday life. Check our YETI Tundra 35 review to know the features, benefits and problems of this cooler. Hope this will help you to understand how much worthy this cooler is. YETI Tundra 35 is an ideal small size cooler which comes with a lot of features. In this YETI Tundra 35 review we will try to find out the good and bad side of this cooler. We will mostly focus on the ice retention capacity and then review the build quality and other necessary features. The YETI Tundra 35 is the smallest version of cooler in YETI’s Tundra series. It is small and portable enough for one or two person to haul. But it still have an impressive capacity of carrying up to 20 cans with a recommended 2:1 ice to contents ratio and substantial amount of foods. Best Use on Camping, hunting, fishing, road trip and other adventure trip. This is a personal cooler or for one or two people depending on what you’re going to do. It’s built to stand against heavy pressure, preserve your foods and drinks for longer time, keep your foods away from bear and finally make you happy during your trip. The YETI Tundra coolers have a fat wall design that gives you extra thick walls that hold up to two inches of insulation. The PermaFrost insulation is injected with pressure which ensures that the inside temperature will not influenced by outside the temperature. The cooler includes cold gasket lock. It helps keep the heat out and it makes your ice stay lot longer. It also has an inner light lid system. There’s a lip that could protrude from the body section and it fits right into the lid just like a glove helping to create that seal and therefore keep your ice a lot longer. The amount of time that ice stays in this cooler is two to three days which is great for short camping. 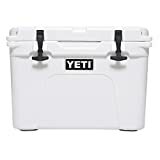 YETI suggest that you pre-cool your items before you put them into the cooler and use dry ice and then you’ll get the longest use out of your ice realistically. It’s really necessary to pack your cooler perfectly in order to get maximum ice retention. YETI Coolers are compatible with dry ice. So, you should use dry ice on it because it provides great cooling power. Another important thing is, the ice will not stay longer if you open the cooler frequently. So, you should be careful on using this during your trip. All YETI Cooler comes with roto-molded polyethylene construction which ensures long-lasting durability and excellent impact resistance. The Extra-thick walls are built with PermaFrost insulation which is injected with pressure. It gives the cooler an excellent resistance to the outside temperatures. It’s very rugged. When you get this in your hands you can feel it. There are 6 different color options available to choose from. The cooler is strong enough that you can stand on this and get a little more height to see what you want to see. It can also be used as a seat. So if you’re going to bring something cold to drink with you, you don’t have to worry about bringing a chair with you. Because you can use that. The Yeti tundra 35 is designed to be carried a few different ways. Color Variations: The YETI Tundra 35 comes with 6 different colors – ice blue, desert tan, le coral, pink and white. T-Rex Latch Handles: The t-rex latch handles are used to secure the lid down onto the body. They’re made of rubber. They’re very durable and long-lasting. Dry-Goods Basket: All tundra models come standard one dry-goods basket. If you want to have something that’s you don’t want it to get wet or you don’t want submerged in ice or water, this dry-goods basket will help you keep them dry. It is very handy and fits right into another molded design. There’s a molded lip inside the cooler so that that this sits right. This is very heavy gauge metal and it is not pliable, will not Bend. This is very sturdy. Tie-down Spots: Only either side of the cooler you have an area where you can fit a tie-down via a strap and still be able to close the lid and not worry about affecting your seal in any way. Bear Resistant: This is bear resistant, so it’s nice. You can actually put a lock on the outside of the cooler and this way there’s nothing to worry about bears getting inside if you’re going somewhere where there happen to be bears in the area. Never-fail Hinge System: There are two hinge pins and an interlocking design which make this cooler very tough and very durable. This is a very tough lid and hinge system does not feel cheaply made in law. Vortex Drain System: The drain plug is made for easy and quick cleaning of the cooler. It has a nice rubber gasket. This is a very rugged design and the hole is big enough that you can drain your cooler quickly. Replaceable: Another good thing about YETI cooler is that, a lot of parts here on the Yeti are replaceable. Lip Grip Handles: It has what Yeti calls these lip grip handles that are molded into the body and you can pick it up easily and carry it comfortably. Double Hull Handles: It has double hull handles which is made with military-grade nylon and you and someone else can carry this cooler easily. Non-slip Feet: This is a very stable cooler as non-slip feet on there. So it doesn’t slide around easily very sturdy you can stand on it without any issues at all very tough very adorable. Warranty: This Tundra 35 cooler comes with 5 years warranty. The warranty is available only in the United States. To get more information about this cooler feel free to check real customers reviews here. Expensive: The most possible downside of YETI Tundra 35 is the high price. This small size cooler costs little higher than other. Since YETI is a premium brand, you will get the best of the price. Q. Where YETI Coolers are made? YETI Tundra coolers are manufactured in the United States. Q. 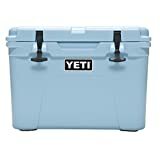 Where to Buy YETI Tundra 35? You can purchase this Tundra 35 directly from YETI website, or purchase it at the best price from Amazon. YETI has several dealers in United States and worldwide, you can also purchase from them. Q. How long does it take to proceed an order? Normally, it takes 1-5 business days to proceed an order and will take 1-7 days to complete the shipment. Q. Is There any Refund Policy? Yes, YETI Offers 30 day refund policy on their products. If you’re returning an item after the 30 days period but within 60 days, you may be able to exchange the item for another YETI item which is equal to the product or have greater value. Purchasing a cooler from YETI is like investing on something. YETI coolers are ideal for people who want quality and performance at the same time. The Tundra 35 is ideal for personal use or two people camping. It features enough storage capacity for storing foods and drinks for two people. 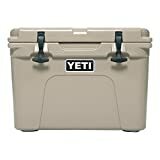 Since YETI is a premium brand, you have to spend good amount of money to get a cooler from them. But if you are looking for quality and performance this will be a good investment. We hope, this YETI tundra 35 review will help you take your decision. If you have any experience using the Tundra 35 cooler, feel free to share with us. We must appreciate your words.